ePublishing Knowledge BaseePublishing Knowledge BaseePublishing Knowledge Base EditorialHow do I add special characters in the WYSIWYG editor? 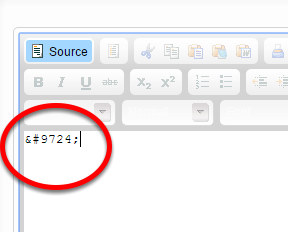 While the WYSIWYG editor used to format content has some special characters available through the "insert special character" icon (See step 2 below to learn how to add characters that are available), some special characters must be added manually using HTML. This article will show you how to add a character to your content if it's not available in the WYSIWYG. Examples of special characters - some of which may be available through the WYSIWYG and others you may need to add using HTML - include &, @, currency symbols, accented letters, letters that don't exist in the English alphabet, arrows, geometric shapes (squares or triangles), math symbols, trademark or copyright symbols and more. 1. Open the WYSIWYG editor from your article, blog post or other content. Zoom: Open the WYSIWYG editor from your article, blog post or other content. 2. 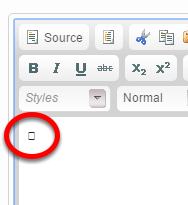 To view the available special characters on the WYSIWYG for easy placement, click the horseshoe shape on the right side (circled below). 2.1. Click on the character you'd like to insert into your content. 2.2. After selecting the character, it will appear in your editor. 3. 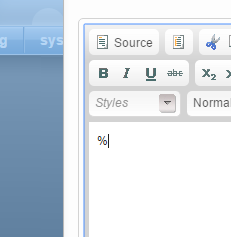 For those special characters that don't appear in the WYSIWYG, click Source in the upper left corner of the editor. 3.1. When Source is selected, the rest of the icons will appear greyed-out. Zoom: When Source is selected, the rest of the icons will appear greyed-out. 4. 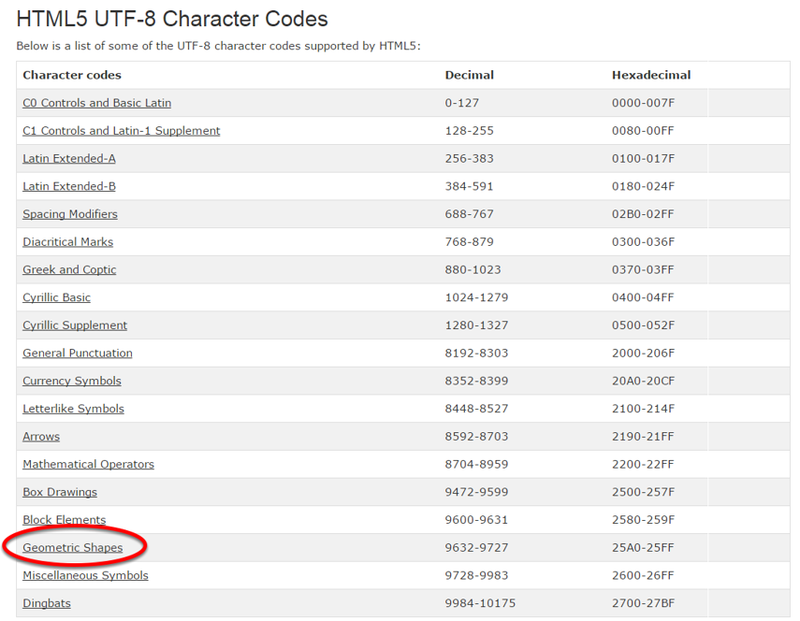 Use the W3C list of approved HTML entities found at: http://www.w3schools.com/charsets/ref_html_utf8.asp. Scroll down until you see the below and click on the category to view character codes. Zoom: Use the W3C list of approved HTML entities found at: http://www.w3schools.com/charsets/ref_html_utf8.asp. Scroll down until you see the below and click on the category to view character codes. Click to view the special character codes. 4.1. Find the number that corresponds with the character you'd like to add. In this case, we're adding a black medium square, which is found under Geometric Shapes. 4.2. Type the special character code between &# and ;. For example: &#9724; for the black medium square. 4.3. Click Source again to return to the standard editor. Your special character should appear. 5. Click Commit Changes when you are done adding content in the WYSIWYG. 6. 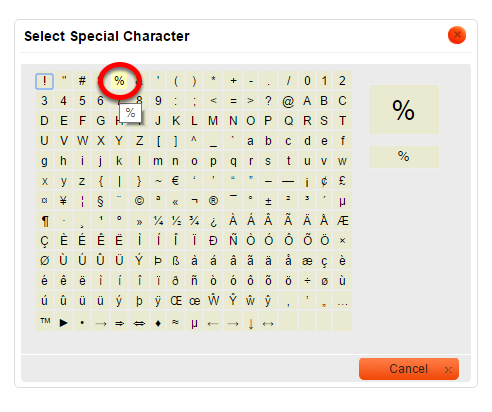 You will see your special character in HTML after leaving the WYSIWYG. 7. When you are done editing your article, blog post or other content, don't forget to scroll down and click SAVE. Prev: How do I set the size of an infographic on my website for optimal readability? Next: How do I copy an article from one of my websites to another?